Gold medalists steal the headlines. But there will be plenty of happy silver and Bronze medal winners in London. Sometimes when you see the number of gold medals that the likes of the United States and China rack up at the summer Olympics, you can’t help wondering if it all doesn’t get a little boring winning gold medal after gold medal. And then you wonder what those athletes who win silver and especially bronze are feeling. China won 51 gold medals in 2008. The 28 bronze medals must have been overshadowed to some extent. After all, the reality is that when you have so many first places, those who finish third don’t get much of a look-in. But then there are some bronze medals that mean a great deal. Take Afghanistan’s solitary place on the podium in Beijing. It certainly hasn't been forgotten. 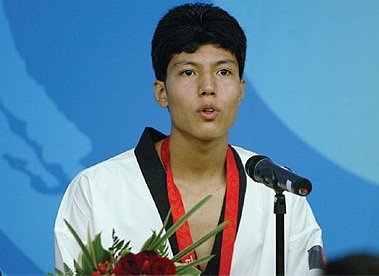 Rohullah Nikpai won the bronze in the men’s 58 kg category of Tae Kwon Do. It was a momentous win, and if he didn’t know that when he was in Beijing, he realized as soon as he arrived home. Thousands were waiting to meet him. He's going to be in London for 2012 and will be accompanied by Nesar Ahmad Bahave, another Tae Kwon Do hopeful. He won the silver at the World Championships in 2007 in the lightweight category (72 kg) and is aiming for something similar this summer. Singapore picked up a solitary silver four years ago, their second ever medal. The first came in weightlifting back in 1960, but in Beijing in 2008, the women’s table tennis team reached the final, where they lost to China. Their semi-final win over a talented South Korean team was something of an epic. The star of Beijing was Beijing-born Li Jiawei, who later became a Singapore citizen. A veteran of the table tennis circuit, Li is back for 2012 and will be joined by Zhan Jian. Neighbor Malaysia also won a solitary silver in 2008. Lee Chong Wei took second place in the men’s badminton. It was the nation’s first medal since 1996, and the second silver in their history.